Those people looking effortlessly relaxed in the yoga studio? They are so not you. Your life barely allows for quiet, let alone meditation. You have a commute that takes longer every year, you cook dinner for a family that doesn't appreciate it, and at the end of all that, you still have to take your dog out for a walk. You are tired, and adding one more thing to the pile is out of the question. Rather than expecting you to find more time to meditate, Mindfulness for PMS, Hangovers, and Other Real-World Situations brings meditation to you. Mindfulness expert Courtney Sunday allows the concept of mindfulness to be flexible, playful, and even fun. With more than 75 everyday meditations, Mindfulness for PMS, Hangovers, and Other Real-World Situations offers targeted suggestions for inner freedom, even if you can't stop scrolling your Instagram feed. Included are meditations for . 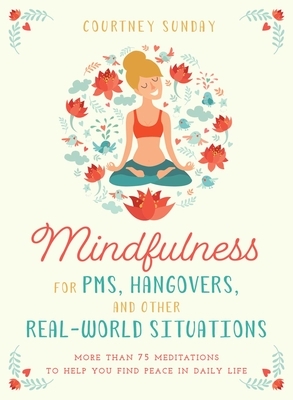 . .
Mindfulness for PMS, Hangovers, and Other Real-World Situations doesn't judge you for being hungover or eating too much cake (in fact, there are mindfulness exercises for both of those situations). Purposeful presence is possible for all of us, even when your Uber is late or the Wi-Fi is down. Courtney Sunday is a health writer, wellness coach, and yoga teacher who specializes in working with people who don't believe they can do yoga at all. She writes articles for publications such as The Globe and Mail, USA Today, and MindBodyGreen. Her preferred place to meditate is on the floor next to her two purring cats. Courtney resides in Philadelphia, Pennsylvania.